Following training ‘Hawkeye’ Lee received his commission and was posted to 501 Squadron which was sent to support the Expeditionary Force in France, arriving on 10 May, only hours after the Blitzkrieg had been launched. Lee quickly opened his score, claiming several bombers during the first week of operations. Having been wounded when his Hurricane exploded following a dogfight, Lee was briefly rested but soon rejoined the Squadron before they moved to their first Battle of Britain base at Middle Wallop. 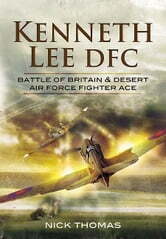 Lee scored more damaged and destroyed enemy aircraft and by the end of July he was Mentioned in Dispatches. Lee was forced to take to his parachute for the second time, learning of the richly deserved award of his DFC while still recovering from his wounds. He later recalled how each of the Squadron’s ‘aces’, even ‘Ginger’ Lacey, had been shot down at least twice during that summer. Lee was later posted to 112 (Shark) Squadron, flying Curtis Kittyhawks on Fighter and Fighter-Bomber missions in North Africa and then to 260 Squadron which was heavily involved in the lead-up to the battle of El Alamein, seeking out and destroying enemy troop columns and fighting off the Luftwaffe which still had air superiority. In March 1943, 123 Squadron began Fighter-Bomber operations against Mediterranean targets, during one Lee was hit by AA and made a forced – landing in an olive grove. He was captured and sent to Stalagluft III just in time to play a key role in the Great Escape.